Global nuclear generating capacity increased slightly in 2014 as five new reactors began supplying electricity, while just one was permanently shut down. The year saw new reactors with total capacity of 4763 MWe connected to the grid: Ningde 2, Fuqing 1 and Fangjiashan 1 in China; Atucha 2 in Argentina and Russia's Rostov 3. An uprate at the existing Fermi 2 unit in the USA saw a further 15-20 MWe added. The world starts 2015 with 437 operable reactors and a total nuclear generating capacity of some 377.7 GWe, compared with 435 reactors and generating capacity of 375.3 GWe a year ago. Construction started on three nuclear units during the year. 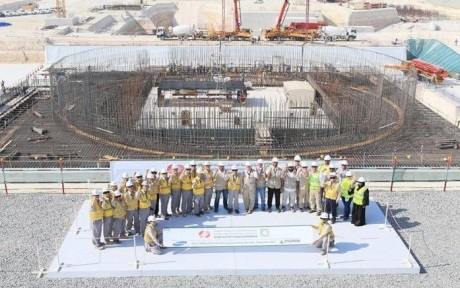 As well the second unit of the Ostrovets nuclear power plant in Belarus, construction also began on the third unit of the Barakah plant in the United Arab Emirates. 2014 also saw first concrete poured for Argentina's prototype CAREM-25, a domestically-designed and developed small integral reactor. The start of work on these units brought the number of reactors under construction to 70, totalling almost 74 GWe in capacity. In late December, Entergy shut down its 604 MWe Vermont Yankee plant in the USA after 42 years of service, marking the only reactor closure during 2014. Although safety regulators had granted a licence for the unit to operate until 2032, Entergy decided in 2013 to close it early for economic reasons. Also in 2014, units 5 and 6 of Japan's Fukushima Daiichi plant were officially classed as being decommissioned. Owner Tokyo Electric Power Company (Tepco) announced in late 2013 that it did not intend to restart the reactors, which were relatively undamaged by the March 2011 earthquake and tsunami that led to the wreckage of units 1-4. As 2014 drew to a close, Japan once again found itself without nuclear power as its entire fleet of 48 reactors remained shut down pending regulatory reviews. The Nuclear Regulation Authority gave approval during 2014 for the restart of four units, but these have yet to resume operation. Safety assessment applications for 17 other reactors remain at the review stage.